Jay Eubanks blames the discovery of fissures for the ruin of an investment home. 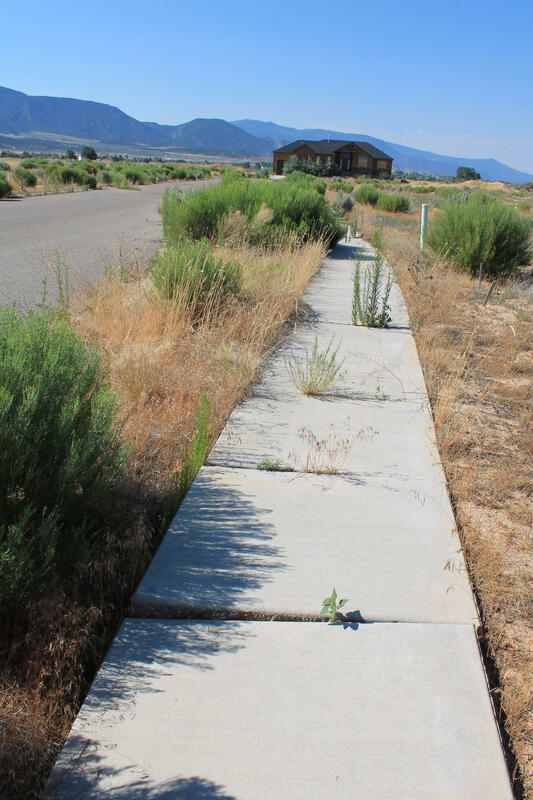 The home in Enoch that Eubanks built and that is now abandoned because of the fissures and subsidence in the area. Here at milepost 80 in Enoch on 1-15 state geologists are inspecting a sinkhole on the right of way. They first spotted this jagged crack last year in images from a remote sensing survey. This fissure, as it’s called, runs underneath the highway, and the geologists worry that it could grow deep and wide enough someday to rupture the interstate. The Iron County city of Enoch called his geological hazards team a few years ago to check out what they thought was an earthquake fault in a new subdivision not too far from I-15. Cracks riddled the sidewalks and pavement. Lund knew right away the problem he was looking at was no earthquake. It's a manmade hazard, a fissure. Bill Lund leads the geological hazards team at the Utah Geological Survey. The team used a variety of tools to confirm that water mining in the Cedar Valley has led to the formation of destructive subsidence and fissures. "Well, what's happening in this particular subdivision is that the aquifer, the groundwater resource in this valley, is being pumped at a greater rate than it's being recharged,” says Lund. “And as the water table has dropped and de-watered, the aquifer has started to settle and compact, and that compaction has now made it all the way to the surface of the valley. So, the ground is cracking, and the surface of the of the valley is settling." 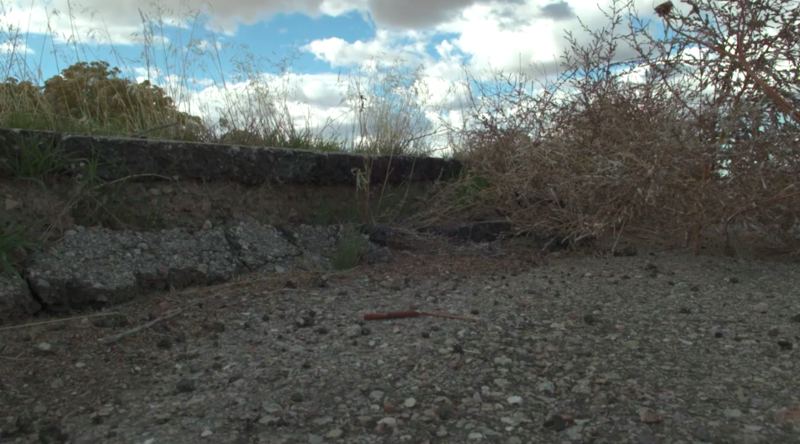 "Subsidence" like this and fissures like these have ruined roadways, railroads and neighborhoods throughout the arid West. California, Arizona and Nevada have spent hundreds of millions of dollars dealing with the damage. It’s a worrisome sign of trouble in the aquifer here, a vast underground reservoir that makes life possible in the dry West. It supplies most of the water to Utah’s homes and businesses, power plants and farms, and it keeps the environment healthy. Jay Eubanks faced a series of setbacks, many of which would have been surmountable if the fissure hadn’t erupted in the new housing development where he had an investment home built. The development in Enoch that turned Lund’s team into fissure detectives is as lonely as a graveyard now. Its one and only house is boarded up. That makes Jay Eubanks the fissure’s surviving victim. He’d built the house as an investment with his family’s savings just months before Lund told the city building officials about the fissure. "The inspector told me about it, and I said, ‘What are you -- what are you talking about?’ ‘You haven't seen the sinkhole?’ ‘No.’ ‘You haven't seen the fissure where the road's broken up?’ ‘No.’"
Eubanks lives 0utside of Iron County, so it wasn’t until he visited the development that he saw a long crack tearing through the road, curbs and gutters. The subsidence even reversed the sewer line, and the city denied an occupancy permit. By 2012, Eubanks had run out of hope. "I exhausted every avenue I could think of getting the house finished,” says Eubanks. “I had already lost out of pocket $108,000. I had no savings, credit card was filled up to the limit. And I had no way to continue making payments on the property." The Eubanks home is the only structure in the now-abandoned Enoch subdivision. Water mining and over-appropriation are not limited to a single person or place in Utah. The state has tens of thousands of water rights files and just one person to enforce them all. Water insiders may praise the state’s approach. But some policy changes are already underway, like the 90-year plan to end water mining by farmers in the Escalante Valley, west of Cedar City. Water lawyer Jody Williams says overusing groundwater is a statewide problem -- not just central Utah’s. "I think our state regulators are going to be more watchful because of these subsidence issues in the future,” she says, “not letting water users take more pump more water out than can be safely replenished. I mean that's the safe yield." The Central Iron County Water Conservancy District is scrambling for solutions to this big and expensive problem. After pulling out of the Lake Powell Pipeline a few years ago, it’s secured rights to Beaver County water. But plans to pipe it into the Cedar Valley face legal and environmental hurdles – and a $150 million price tag. Paul Monroe says his challenge as the district’s general manager is helping people grasp what's at stake. Meanwhile, that subdivision fissure in Enoch keeps growing. It’s 8 miles long now, and the difference between the crack’s edge and the land surface is nearly 3 feet on one end. For Eubanks, this policy snag is painfully personal. The bank took the house. The county took the land. And this LDS bishop faces years of bankruptcy payments. His family has given up even the smallest of luxuries. They used to enjoy being Secret Santa, but now they get holiday gifts from someone else. Many unlucky breaks plague his investment story, but Eubanks mostly blames the sinking and cracking ground. "Because people were taking more water than they were allotted, the fissure has grown, and no one was willing to enforce any laws to stop everyone from taking more water, he says." "So the fissure killed everything." Sprinklers near Milepost 80 keep the corn and alfalfa green, but Nature can’t keep up with the 1 million acre feet of water Utahns pump from the ground here each year. That means Utah's drought underground has become far worse than the dry landscape we can see. And there’s no end in sight. The State Auditor’s office released its review Monday of the embattled Jordanelle Special Service District, investigating allegations of mismanagement and misuse of public funds. Utah lawmakers will be taking a hard look next year at how much water developers pledge for each new property. The Utah Foundation has released a new report on the state’s water outlook in the face of what is expected to be huge population growth over the next 35 years. The report is the third in a series of studies looking at the impacts population growth will have on Utah. It looked at the challenges Utah’s water supply could be facing and came with several recommendations, including moving away from funding water agencies with property taxes, and toward funding them with increased water rates. Brigham Young University geologists have found evidence of some of the largest volcanic eruptions in earth’s history in their own backyard. The scientific journal Geosphere has published some of their recent findings about supervolcanoes. Looking at the land West of Cedar City, known as Wah Wah Springs, there is no indication that there was any kind of volcano, let alone one of the largest eruptions in earth’s history. But BYU geologist Myron Best says it’s been hidden in plain sight for millions of years.